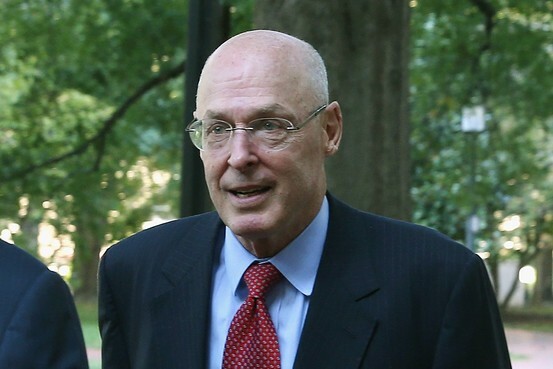 WASHINGTON—Former Treasury Secretary Henry Paulson on Monday defended the government’s actions in the 2008 federal rescue of American International Group Inc saying the bailout package was “harsh” on shareholders but necessary at the time. He testified for two hours before being dismissed as part of a lawsuit alleging the AIG rescue cheated shareholders of $40 billion. Mr. Paulson, whose testimony ended sooner than expected and produced no bombshells, fielded questions about possible private-sector solutions for AIG that plaintiffs contend the government wrongfully brushed off. Mr. Paulson disputed that any of the overtures could have resulted in a deal at the time. The former Treasury secretary also answered questions about the rescue package’s harsh terms, which the plaintiffs allege were an unlawful attempt to penalize AIG. Mr. Paulson countered that the government was seeking to avoid creating moral hazard and that the government’s public comments about the package’s toughness reflected political realities, in which the bailout was unpopular. Moral hazard refers to the possibility that other firms would engage in risky behavior on the belief that they could get aid from the government on better terms than they could in the private sector. The original package to the nearly collapsed AIG included a 79.9% ownership stake for the government and annual interest of at least 12% on an initial $85 billion, collateralized loan. The government’s assistance expanded to $184.6 billion at its peak, and taxpayers’ ownership stake hit 92%. AIG fully repaid the package by the end of 2012 after regaining its footing, and the government has calculated it received a positive return of about $23 billion. Mr. Paulson is one of three prominent engineers of the rescue expected to be called to testify this week in the class-action lawsuit brought by Starr International Co., an investment and charitable firm run by former AIG Chief Executive Maurice R. “Hank” Greenberg. Starr was AIG’s largest shareholder at the time of the rescue. The others are former Federal Reserve Chairman Ben S. Bernanke and former Federal Reserve Bank of New York President Timothy Geithner. Starr’s lawyer, David Boies, called Mr. Geithner to the stand after dismissing Mr. Paulson but was told Mr. Geithner was in New York on the expectation he wouldn’t be needed before Tuesday morning. Mr. Paulson was quizzed by Mr. Boies about an overture from a Chinese sovereign-wealth fund that the then-Treasury secretary’s staff learned about on the afternoon of Sept. 16, 2008, according to court filings by Starr. That was some hours before AIG’s board approved the bailout. Mr. Paulson also indicated in his testimony that the Chinese at that point didn’t know the full scale of the financial crisis. “I sure wouldn’t have wanted to spook the Chinese,” by detailing the depths of the problems, as Mr. Paulson and officials at the New York Fed were putting together the AIG rescue. Mr. Paulson was slated to face at least six hours of questions but was excused after less than two hours because, Mr. Boies said, he answered questions so quickly and to the point. Mr. Boies focused on past comments Mr. Paulson made referring to the rescue terms as punitive. He also asked Mr. Paulson to confirm comments he made on “Meet the Press” in September 2008, in which he said AIG would face a liquidation. Mr. Paulson had a crisp memory of some events during the financial crisis but was foggy on a number of details, answering often “I do not recall” to questions about his involvement in the AIG intervention. Asked about his specific actions on Sept. 16, 2008, for instance, Mr. Paulson said, “I had a lot going on that day” but agreed that he briefly participated in a conference call hosted by the Federal Reserve to discuss the initial AIG rescue. He also said he played a direct role in finding a new CEO to take over at AIG, former Allstate Corp. Chief Executive Edward Liddy. “We did things based on circumstances we faced,” he said. “If we have a rescue that trumps failure and prevents failure, then it was important that the terms be harsh here. I look at moral hazard very seriously,” he said. Mr. Paulson said AIG had become something of a “symbol” for many Americans of Wall Street excess, and that it was important for people to think the company and its shareholders weren’t getting off easily. Another reason that Treasury officials had to convey that AIG was facing harsh rules was because of the political backlash, Mr. Paulson said. “It was a clash between markets and politics,” he said, adding that if either presidential candidate at the time didn’t support the government’s actions, public support would crumble. He said he meant that parts of the company would have to be liquidated to repay the government’s loan.